Newly available data indicate that the nation’s Hispanic student population continues to grow. More than 12.4 million Hispanics were enrolled in the nation’s public schools pre-K through 12th grade in October 2011, according to a Pew Hispanic Center analysis of U.S. Census Bureau data. Overall, Hispanic students make up nearly one-quarter (23.9%) of the nation’s public school enrollment, up from one-fifth (19.9%) in 2005 and 16.7% in 2000. 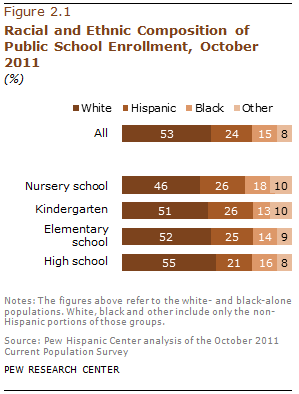 In 2011, Hispanics made up 21% of all public high school student enrollments. As students in nursery school progress through kindergarten and into elementary school and high school, Hispanic students will make up a rising share of public high school students and all public school students in coming years. According to the U.S. Census Bureau, by 2036 Hispanics are projected to compose one-third of the nation’s children ages 3 to 17 (U.S. Census Bureau, 2008).